Top Banana Art is an Etsy shop which sells the most gorgeous high quality prints. Georgia actually has a degree in Games Art and Design which is so cool! Her art is so cute and the prints are mainly A5/A5 and printed on 160gsm paper so they're nice and thick. Georgia recently gave me the opportunity to work with her so I chose two beautiful pieces which I thought would look great in my home. 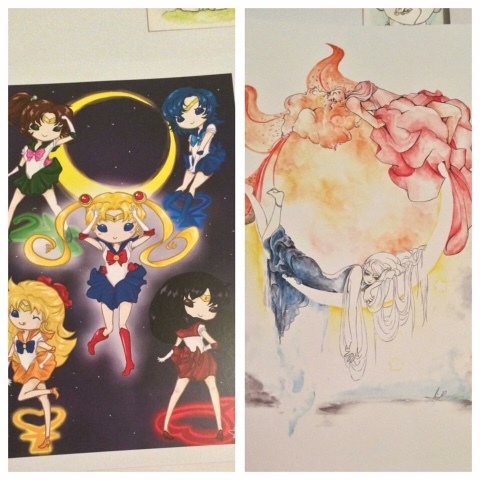 The first is a Sailor Moon print and the second is a Sol and Luna print. I'm so pleased with them, the colours are just as vivid as online and the paper is super thick and glossy! Her art style is so pretty - I love Sailor Moon chibi style. Definitely check out Top Banana Art as she takes custom orders too so you can get the perfect piece for you. It's worth noting that these were shipped to me within a couple of days as well which is fab. Check out Georgia's shop here.